← Flip Card Using Framelits and Blooming with Kindness – Stampin’ Up! Gifting with “Hooray for a Party” Digital Studio & New Weekly Deals from Stampin’ Up! 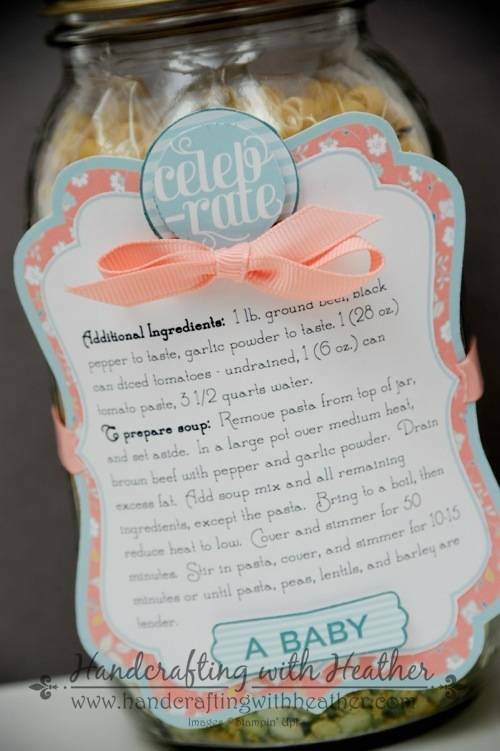 Today’s share is a great gift that you can give for any occasion featuring Hooray for a Party Digital Download (Sale-a-bration item available FREE with a $50 purchase through March 31st!) from Stampin’ Up! 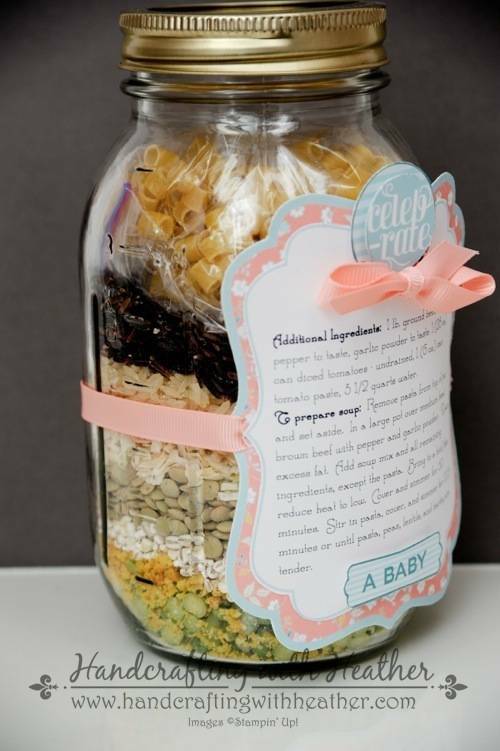 My cousin and his wife just recently had a baby, so I made them this Soup-in-a-jar gift to make life easier during this time of sleepless nights. 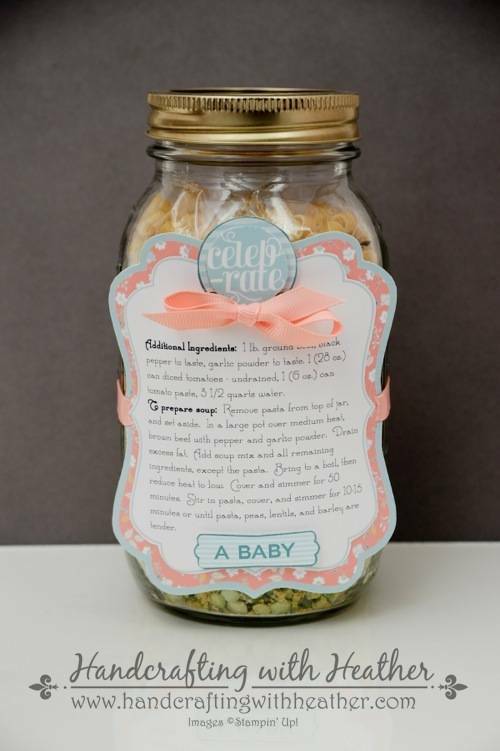 I used My Digital Studio to create a cute label for the jar. I just love giving this “Friendship Soup” as a gift. It is inexpensive, beautiful, and most of all tasty! If you enjoy this post today, please leave me a comment. I would love to hear what you think. On March 31st, I will do a drawing and one lucky person who left me a comment will receive a handcrafted card in the mail! Also, if you enjoy reading my posts, why not have them delivered to your inbox automatically. Just click on the “follow” button in the sidebar. 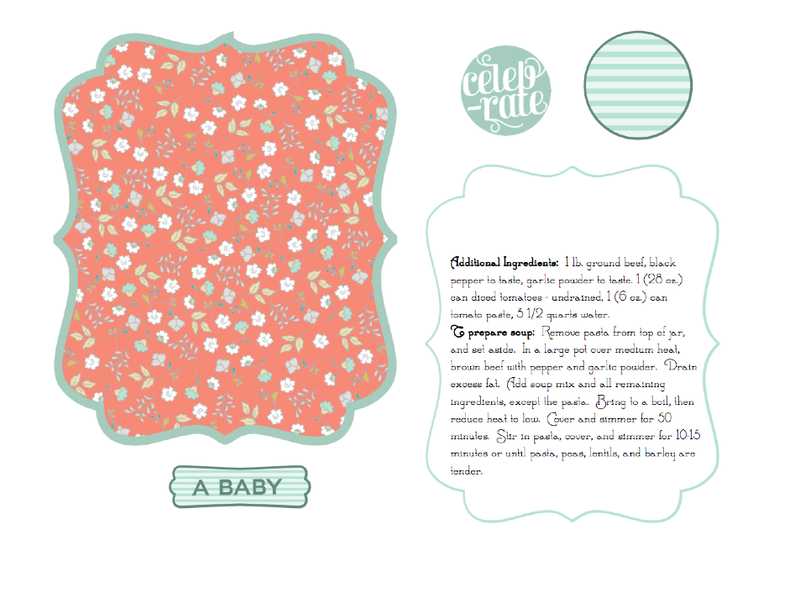 I designed my label using My Digital Studio (MDS) (digital download and disk) from Stampin’ Up! To begin, I built the label in MDS so that it looked the way I wanted it to when it was on my jar. I used the digital papers and stamps from the Hooray for a Party Digital Download, and created my shapes using the digital versions of the decorative label punch and the modern label punch (included with My Digital Studio Software). I just love using digital punches because you can resize them any way that you want! 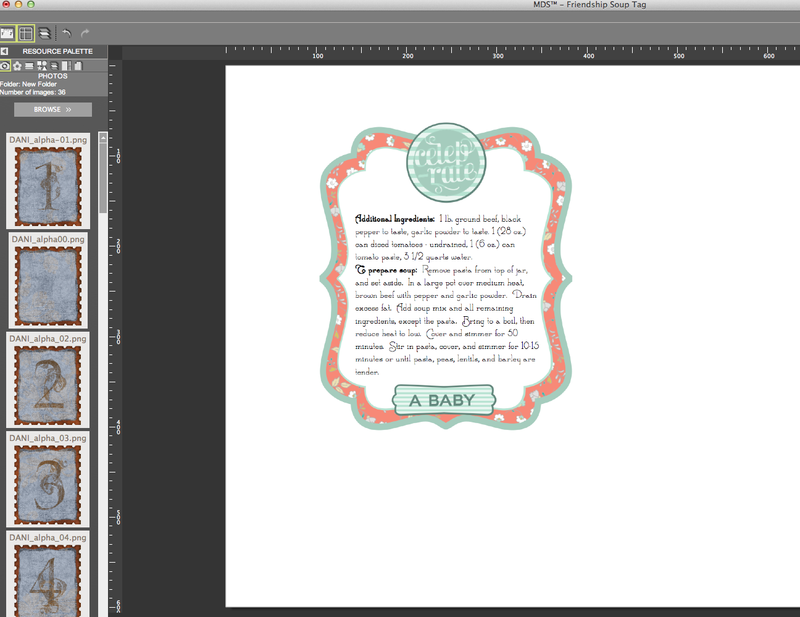 Then, once the label looked the way I wanted it to, I separated all the different elements before printing them. I printed the design on Whisper White card stock and cut out each element. I layered the main label pieces and attached them using SNAIL adhesive. Then I cut out the stamps and attached them with Stampin’ Dimensionals. I finished the label with some coordinating ribbon and tied it to my mason jar. Now, I know what you are thinking… what about the soup? First of all, this soup is delicious! It is also super easy to make (both in the jar, and afterward)! I like to make a bunch of these and give several as gifts and keep a few in my pantry too. If you would like to make some yourself, you can find the recipe here. I have made a couple of modifications to the original recipe. First, I add 1/2 cup of wild long grain rice to the jar because I think the dark color makes a very pretty layer. To compensate for the extra dry ingredient, I also increase the water to 3-1/2 quarts. This makes a BIG batch of soup. I usually serve 1/2 the batch to my family during the week and freeze the rest. This Friendship Soup-in-a-Jar makes the perfect gift. It is always very well received. I hope that you have enjoyed reading about it. If you did, please pin it to Pinterest for me. I am new to blogging and I would love your help in developing a blog following. If you scroll to the bottom of the post, you will find a “pin it” button just below my supply list for the project… and, don’t forget to leave me a comment for your chance to win a handcrafted card! If you would like to order the My Digital Studio software, please click here to shop in my online store. Remember you can earn the Hooray for a Party Digital Download for FREE (Sale-a-bration item) with a $50 purchase. They are clearly a great choice. To see the new photopolymer stamp sets from Stampin’ Up! click here. This is such a great idea and I am definitely going to try the soup and make some gifts! Thanks for sharing – love your style!